Cynthia Piantedosi has always been different from her peers. In high school, when other girls were obsessed with boys and parties, Cynthia found her fulfillment in prayer. She was raised by her widowed father and her grandmother in a fairly tough Boston suburb. The Church was always important in her family. But for Cynthia, it went beyond Sunday Mass. She spent hours praying every day. When she wasn’t praying, she engaged in deep theological discussions with her parish priest. As Cynthia continues in her devotions, the glimpse-like visions she had as a little girl expanded, until she knew God was calling her to a higher purpose. When her beloved priest is killed, Cynthia suspects the radically conservative Catholic group Lamb of God is behind it. She finds another priest she trusts, and he ends up being banned from the Church. Cynthia makes the rounds of the Boston Catholic hierarchy, till she’s finally granted an audience with a Vatican official. That meeting doesn’t go nearly the way she hoped. Worse yet, Cynthia finds it tough to know whom to trust. If she can only speak to the right person, she’s convinced this mission God has given her will be explained. However, she soon learns that Lamb of God has its acolytes in Rome as well, and if Cynthia trusts the wrong person, she could end up dead. 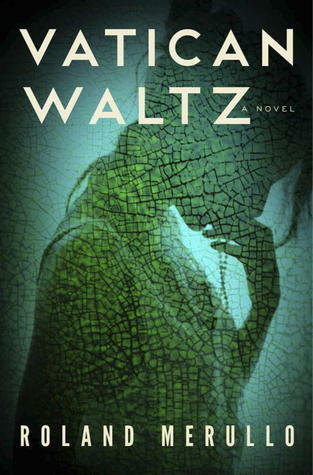 I really enjoyed “Vatican Waltz.” Cynthia makes a wonderful narrator. Author Roland Merullo does well portraying her as consistently humble—she doesn’t feel special because of her “spells” or visions, nor does she make a big deal out of praying three hours a day. It’s just part of who she is. She’s never had a boyfriend, but she doesn’t pine over it. Boys have just never been a big priority for her. When she feels compelled to expand her search for answers—travelling to Rome to do so—she doesn’t hesitate. We sense, too, that her home life with her devout grandmother fed Cynthia’s spiritual hunger as well. Most of all, she comes off as a person with a deep faith in her religion and her God, and wants to devote her life to their service. I’m not Catholic, and I was initially worried that I might have some difficulty following “Vatican Waltz.” This was no problem at all. Cynthia’s story drew me in quickly, and I devoured the book in one sitting. It’s not that there is wall-to-wall action, either. Something about Cynthia being such a rare person in today’s world made me curious to see how things turned out for her. At the end, this is a story of faith: Cynthia’s faith in God, in The Church, and—ultimately—in herself. The way they end up being sorted out is nothing short of miraculous. This entry was posted in Books, General Fiction, Mysteries/Thrillers, Religion/Spirituality. Bookmark the permalink.